Click on the links to download the worksheet and teacher's notes, and to find out more about William Shakespeare and his play, "Macbeth". 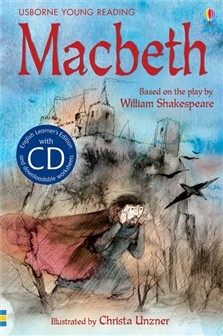 Macbeth is the bravest general in Scotland, and a loyal servant to King Duncan. But then he hears that one day, he could be king himself. Mad with ambition, Macbeth sets out on a bloody path to power. With internet links to find out more about Shakespeare and the play.